We are so excited and looking forward to another Day of the Dead festivals in Merida, Yucatan this year. We were overwhelmed with kindness and generosity last year as we walked along the parade route as all the preparations were being done. It was a great experience to be there a little bit early and to have the opportunity to talk to a lot of people. We learned so much and are hoping to learn a lot more at this years event. We have missed the altars which are set up for the Day of the Dead festivities in Plaza Grande, but this year we are going to make it on time! Then we will head over to the parade route and the main cemetery in Merida. 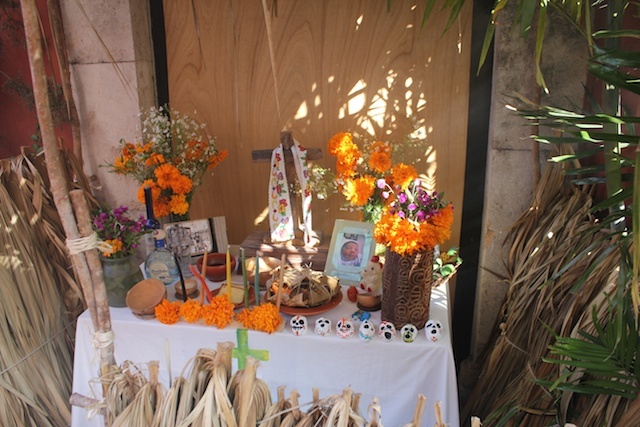 Día de los Muertos is one of the festivals we have learned a lot about living in the Yucatan We are trying to learn as much as we can about the culture in Mexico, and this is certainly a great opportunity to learn about this festival. Definitely recommend this for anyone looking to fully experience the Yucatan. The best Día de los Muertos Event… the parade (paseo)! This year, it will start on October 31 (Friday) at San Juan Park and go down past Ermita to the Cemetery. Starts at 6 PM. Be there! Just wondering what time the altars etc are set up in Plaza Grande? will be coming from Tulum and wondering if it will be okay to get the bus to Merida on 31st or if it might be better to arrive on the 30th. Are there any Dia de los Muertos celebrations happening in Merida on 1-2 Nov? Hi, from what I can see, the Hanal Pixan altars are set up in Plaza Grande in the morning and taken down shortly after lunch. I see from 9am to 3pm for the exhibition of altars. Plaza Grande is located at Calle 60 x61, 62 y 63 Centro Merida. I believe that most of the activities happen on the 31st, all day long. We have been late every time for the altars so I would recommend going earlier if possible.